Known as a pioneering pediatric cardiologist,” Helen Brooke Taussig was born on May 24, 1898. Born in Cambridge, Massachusetts, Helen was the youngest of four children. Her father Frank W. Taussig, a well-known economist, taught at Harvard and was an advisor to President Woodrow Wilson. Her mother Edith Taussig, a natural scientist, died when Taussig was only eleven. Taussig overcame many struggles during her childhood: she was frail, suffered from tuberculosis, a bout of whooping cough caused severe hearing loss and she was dyslexic. Despite these obstacles, Taussig finished high school and enrolled at Radcliffe College in 1917. She transferred from Radcliffe to the University of California, Berkeley, and was awarded her B.A. in 1921. She was denied admission to Harvard Medical School, which at that time did not admit women, but returned to Boston to take anatomy classes at Boston University. A professor at BU encouraged her to apply to medical school at Johns Hopkins, one of the only medical schools in American that accepted women at that time. Taussig applied and was accepted to Johns Hopkins, where she specialized in cardiology. She earned her medical degree in 1927. Taussig remained in Baltimore at Johns Hopkins where she worked in the pediatric cardiac clinic. In 1930, she became the physician in charge of the children’s pediatric clinic. In 1946 she became an associate professor of pediatrics. Because the hearing loss she suffered as a child prevented her from using a stethoscope, Taussig utilized many new technologies such as electrocardiographs, x-rays and other physical examination methodologies in her diagnoses. In 1942 Taussig discovered that “blue babies” resulted from a lack of oxygen due to a blockage in the blood vessels to the lungs. With vascular surgeon Dr. Alfred Blalock, Taussig developed a procedure, now known as the Blalock-Taussig shunt, to remove the obstruction in the blood vessels. This procedure, first introduced in 1944, has since saved thousands of lives. In 1947 Dr. Taussig published the book Congenial Malformations of the Heart. For her work in the field of medicine, Taussig received 17 honorary Doctor of Sciences degrees from universities around the world. In 1964 President Lyndon Johnson awarded her the Medal of Freedom. In 1965 she became the first woman president of the American Heart Association. Considered the founder of pediatric cardiology, the pediatric cardiac center at Johns Hopkins is named in her honor. 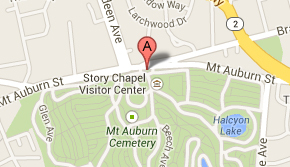 Helen B. Taussig is buried at Mount Auburn in Lot 1520 on Columbine Path.